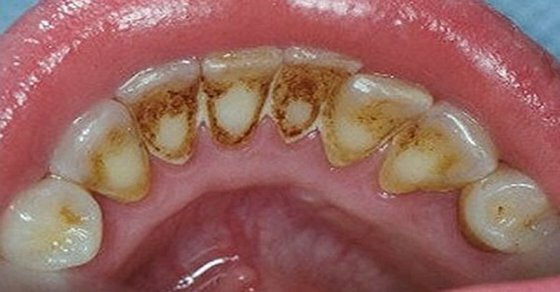 This home remedy on How To Get Rid of Dental Calculus At Home Naturally will be a gonna-try if you have the unpleasant yellow tartar on teeth, which arises from the deposition of bacteria and causes inflammation of the gums, even you brush and floss your teeth twice a day to remove plaque so it doesn’t turn into tartar.If you feel like horror and not going to dentist by shooting both sides of teeth and have deep cleaning (which I really don’t want to myself), try to get rid of calculus using this trick. All you need is a few ingredients and a couple minutes of your time. Cover the shells with water and set the pan on a stove burner. Then set the dial to medium-high and bring to a boil. Once the mixture begins to boil, turn the dial to a low setting. Allow the walnut shells to simmer in the water for about 10 minutes. Then turn the dial off, but leave the pan on the burner for just a few minutes. Soak your toothbrush in the resulting mixture and brush your teeth for five minutes. Repeat this procedure in the morning, afternoon and evening hours. Add everything into a pan and allow the mixture to cook over low heat for 1 hour. Brush your teeth the with resulting mixture after each meal. Another great way to remove plaque is to brush your teeth with apple cider vinegar, but I would only suggest doing this once a week.